This was the fourth Puzzle Keepers puzzle I created, this one on the occasion of my nephew’s 7th birthday. In this, I introduced an antagonist faction- the Knowledge Containment Initiative (KCI), as a sort of bureaucratic and vaguely fascist foil to the open nature of the Puzzle Keepers. 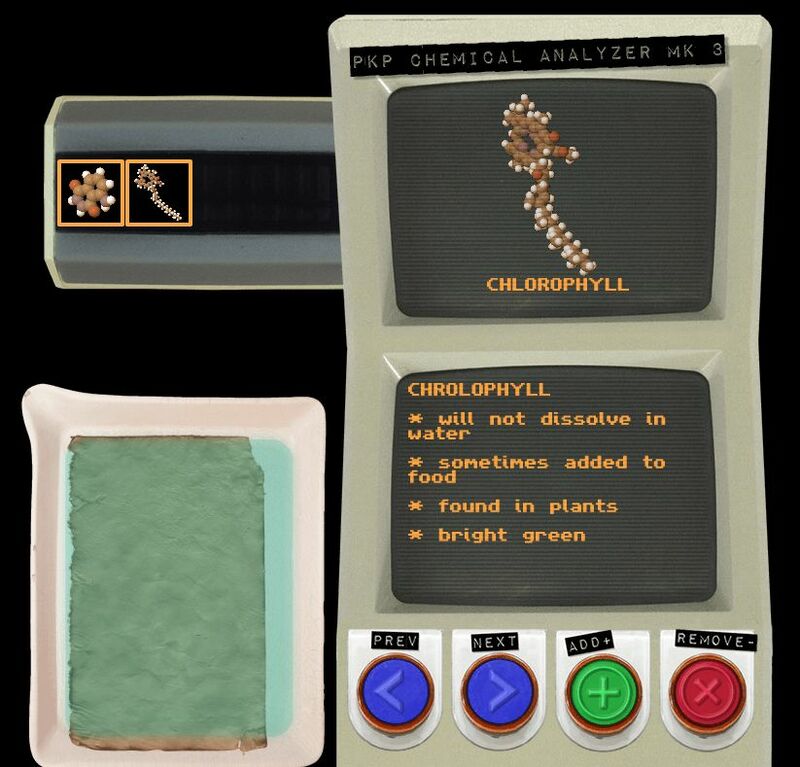 The backstory for the puzzle was that a set of papers (“Folio XIII”) that had long been in the possession of the PK had been stolen by Knowledge Containment agents. The pages were blank, but both groups had good reason to believe that there was invisible writing that could be revealed by applying the proper substance. KCI scientists worked at the problem, and were getting close. But luckily for our heroes, the information was liberated from a KCI facility and returned to the PK. However, since KCI is so committed to containing information, it was stored in an unconventional manner, on a series of slides. A KCI device for reading the slides was obtained as well, though it was unfortunately not in working order. First, the machine had to be repaired. Secondly, the machine could be used to read the slides. First off, the slides. The slides were presented in a wooden box, and there were four of them. Each one had the chemical composition of a given compound, along with some facts about the substance. I made the slides by printing out the images on shrink plastic, then using a heat gun to shrink them down. 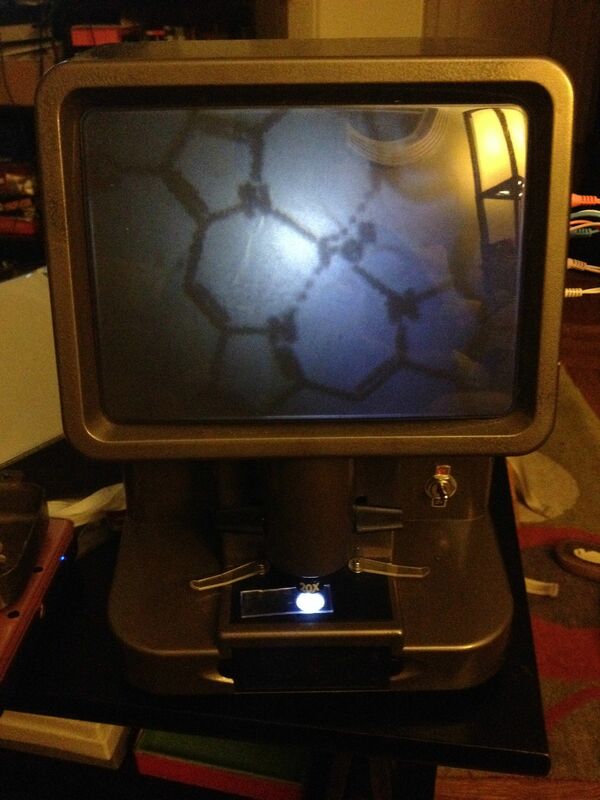 The MVD-790 started its life as a kid’s microscope. I modified it and added an arduino to add the actual puzzle. To solve the puzzle, an access panel must be removed, and four wires must be plugged in in the correct order. I created the access panel using OpenSCAD and had it printed via Shapeways. The cover was a modified plastic box from a local Japanese dollar store. Here’s what it looked like with the panel installed, and then with the cover added. I unfortunately forgot to get a photo after installing the wires, but I did get a few of the process. Here’s the panel after adding the wires (headphone cables in four different colors), and an in-progress shot of testing the setup with the arduino hooked up and everything plugged in. But four wires can be plugged in in 24 different ways, and brute-force approaches are no fun. 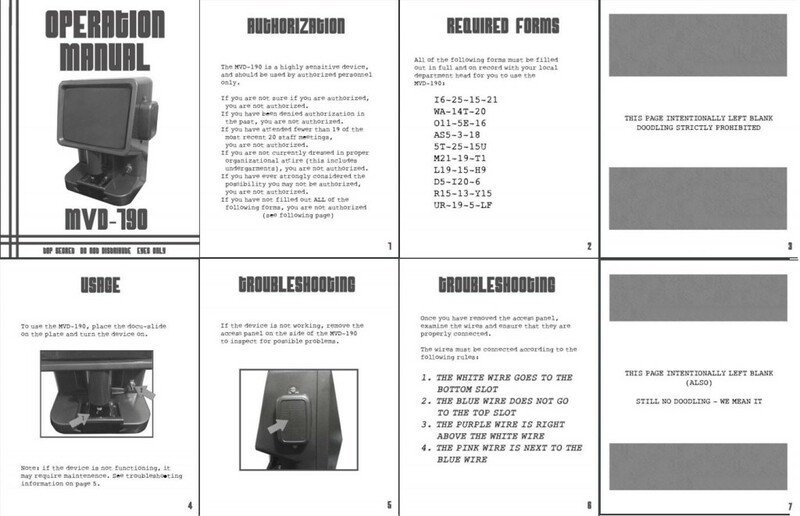 So, I created a KCI manual to go along with the device. 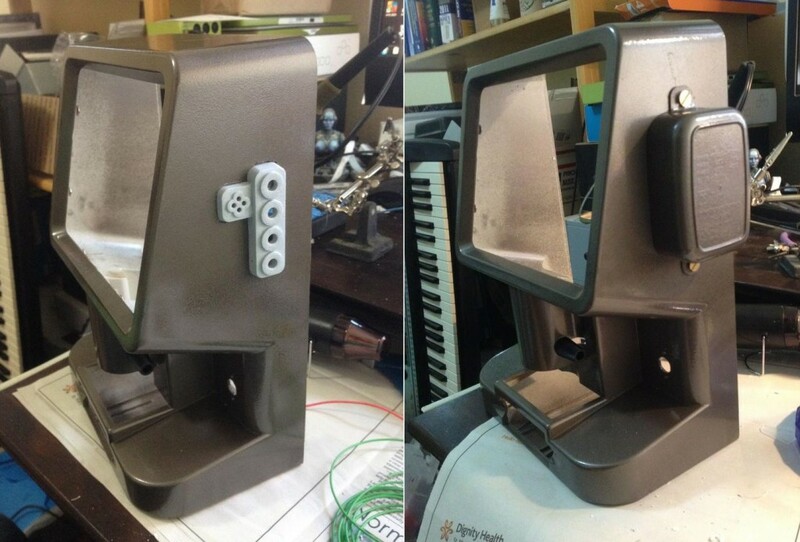 I tried to give it a cold-war tech feel (which was also the reason I went with Hammerite for repainting the device). Once all that was done, the MVD-790 could be used to view the four slides. To see all of the information, the slides have to be moved around a bit, which I liked since it made it a bit more interactive. At this point, it was time to move on to the online component. 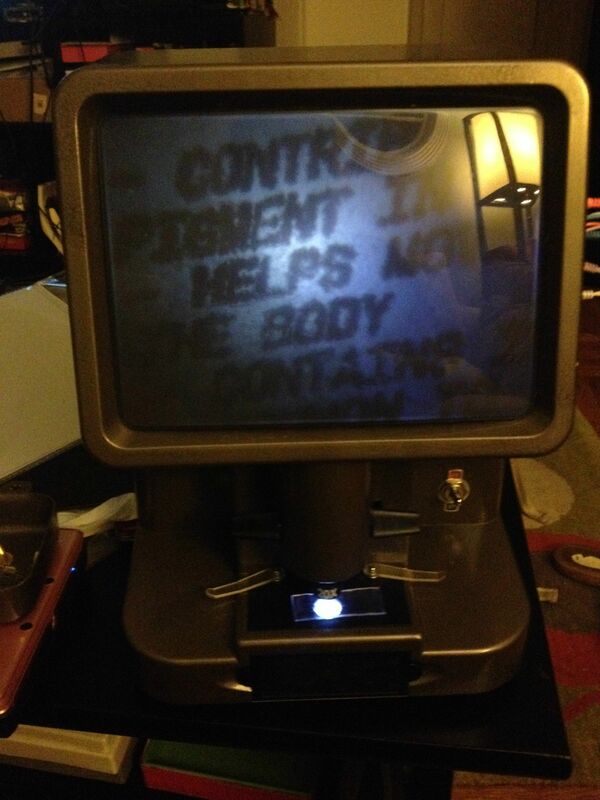 The letter I sent along with the MVD-790, the slides, and the manual, also directed my nephew to a URL containing the “PKP Chemical analyzer MK 3″. This was a minigame I implemented using Haxe and published as a SWF. 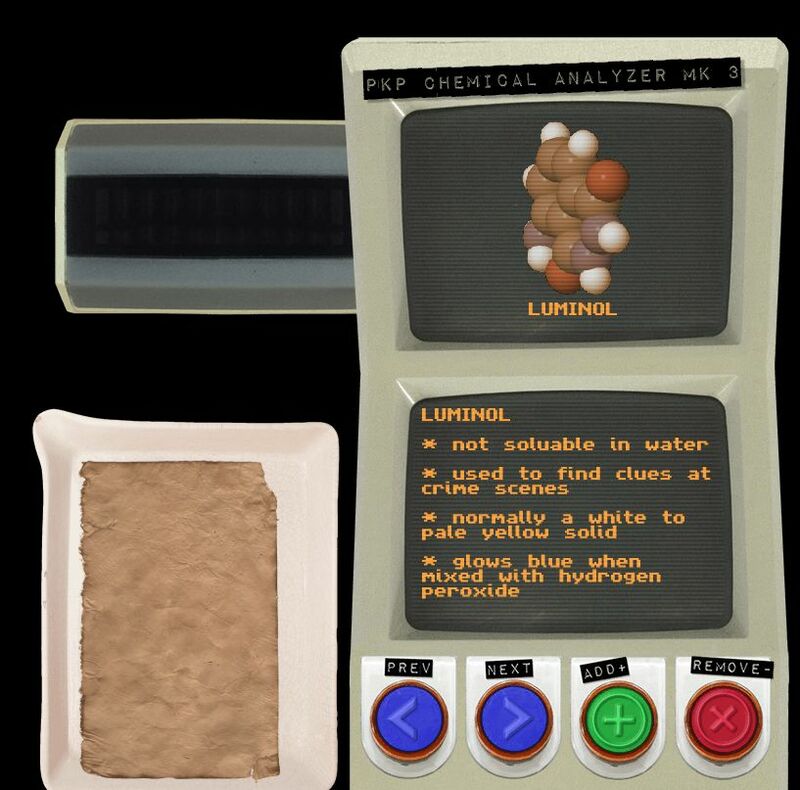 In the game, the user can flip through various chemical compounds and view both the structure and a few facts about each. They can also add or remove each substance, up to four different ones. When a substance is added or removed, fluid fills or drains from a pan (in the lower left) containing one of the blank pages from Folio XIII. 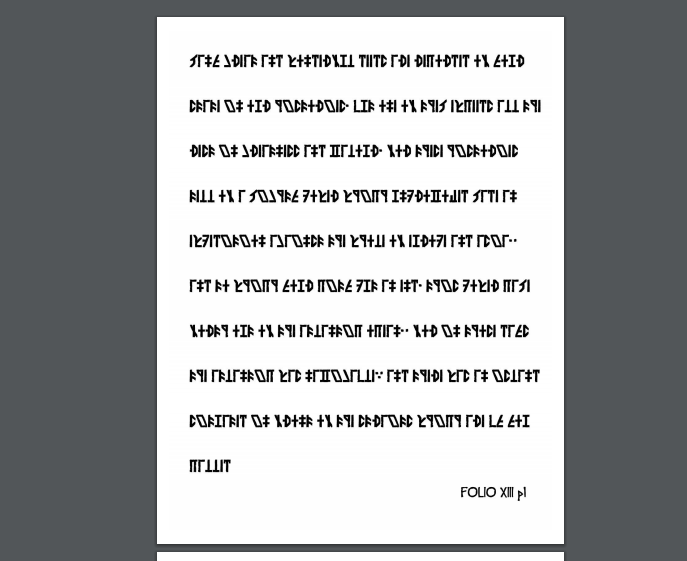 If you add the four compounds from the slides, text appears on the page, and you’re given a link to a printable PDF of the full contents of Folio XIII. Here’s video of the puzzle being solved. The page that appears at the end wasn’t supposed to appear in english, but the font didn’t embed, so it currently ends up defaulting to plaintext. This was an oversight on my part- I had installed the ciphertext font on my machine, so I didn’t realize the mistake until much later. To try the game for yourself, head here (requires Flash). Note that it takes a while to load the images, so you might be looking at a black screen for a bit. The proper solution would be to add a preloader, but that was one of the casualties of limited time. If you solve the online component and choose to print the pages, you are redirected to a PDF that has five pages of ciphertext. The code used is the same as that from the second PKP puzzle, The Metal Apple. If you decode the document, you get a passage from Plato where he talks about Atlantis. The origin of Folio XIII was also aluded to in another PKP puzzle, created for my girlfriend’s niece- The Lost Journal of Cora Aldencamp. If you complete that puzzle and print out Cora’s lost journal, you find that she describes how she obtained some blank pages from a rare book dealer. Overall, I was pretty happy with this one, though I’ve since tried to move away from puzzles that rely on a single, non-reproducible physical component in the interest of making things that can be fully experienced by people other than a single recipient. If you’d like to see some more photos of the build process for the device, head over to this imgur album.